Demotix/Elyxandro Cegarra. 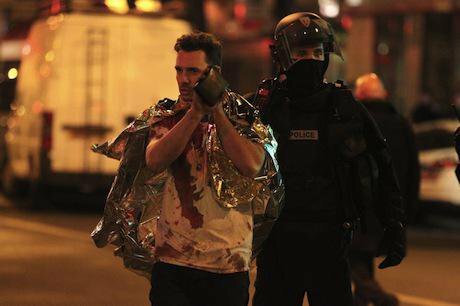 All rights reserved.A week of horrible carnage – bomb blasts in Beirut and Baghdad and then the cold-blooded shootings in Paris. Each of these acts of terror left dead bodies and wounded lives. There is nothing good that comes of them – only the pain of the victim and then more pain as powerful people take refuge in clichéd policies that once again turn the wheel of violence. How does one react to these incidents? Horror and outrage come first. They are instinctual. We grieve for the dead: the young parents of Haidar Mustafa (age 3), who shielded him and spared his life as the explosion in Beirut tore them to shreds. In Paris, the terrorists killed Djamila Houd (age 41), who worked for Isabel Marant, at a café. There are faces to each of the victims. Each of these faces will appear in the press and on social media. They will smile at us, telling us about their best days and their promise. None of them had an active role in any conflict. Their murder had nothing to do with them. We will be bewildered by the incomprehensibility of these deaths – the waste of life in the face of death. We will search for explanations. It has already become clear that the perpetrators in all these bombings – Baghdad, Beirut and Paris – is ISIS or “Daesh”, the group that controls a large section of Iraq and Syria as well as parts of Libya and Afghanistan (with fraternal groups in Nigeria and Somalia). ISIS, like al-Qaeda, is tentacular – it does not have a head, only limbs that are inspired to act in fury. If it is ISIS, why are they striking in these places? For those in the west, the bombings in Baghdad and Beirut will not take up too much time – after all, the western media seems to suggest that bombings of this kind are routine in these places; they are almost natural. In October, 714 Iraqis died in acts of violent terror. These monthly numbers remain the same if we go backward to 2003, when the US invaded Iraq. For eleven years, then, Iraq has faced such an enormous death toll, with the population in a comatose trauma. There is little regard for the people here, whose death and life in death – occasioned by western wars – is now a footnote to global concern. Macho language about “pitiless war” defines the contours of leadership. French president Francois Hollande reacted to the Paris attacks with tough words: “we are going to lead a war which will be pitiless.” But the west – including France – has already been at war against both ISIS and groups like ISIS. Who else will be attacked? Will the strategy change? Will the western leaders be able to take a longer view than one constrained by the emotional reaction of the present and be able to see past the reflex of more war? Would the western intelligentsia and its leadership be able to acknowledge that some of the strategic choices made in the west have only exacerbated animosities and conjured up a great many threats? It is unlikely. Macho language about “pitiless war” defines the contours of leadership these days. Little else is on offer. It is red meat to our emotions. Where did these ISIS attackers come from? The temptation is to blame religion or race, to take the eye off more substantial areas of investigation. Amnesia is the order of the day. Each terror attack on the west resets the clock. No-one must pay attention to the western and Saudi-backed World Muslim League, whose job was to destroy the forces of secular nationalism and communism in the Arab world in the 1960s and 1970s. All those who were on the good side of history fell to the sword, destroyed as anti-Islamic in order to protect the Gulf Arab emirates and the Saudi kingdom as well as western interests in oil and power. We must not mention the western and Saudi assault on Afghanistan in the 1970s, before the Soviet intervention, to cut down that nation’s communist republic. No one should talk about the creation of the “mujahideen”, whose core contained a brutal kernel that exploded into al-Qaeda. Why make so much of the wars on Iraq and then on Libya and Syria, which wrecked states and turned them – like Afghanistan – into playgrounds for the “jihadis”, children of the Cold War? Disbelief will greet those who remind us of western violence, from the aerial bombardment of Libya in 1911 to the bombing of Libya in 2011 – untold numbers dead; “it was not war,” wrote a journalist in 1911, “it was butchery.” Few will go to their shelves and pull out Leila Sebbar’s La Seine était rouge, a searing novel about the French government’s murder of hundreds of pro-Algerian protesters in Paris in October 1961. Each terror attack on the west resets the clock. You will read these words and say, are you blaming the people who died for their own death? You will be outraged at me. You will not be outraged at the history of these countries, of the death they have occasioned, of the misery they have concocted and then denied. You will not ask, why did these thousands of Europeans go to Syria and fight these last few years, or why the French foreign minister – Laurent Fabius – seemed reticent to place the al-Qaeda affiliate in Syria on the terror list? You will not ask who influenced these young men, sanctified by their governments to go fight in a war elsewhere and then inspired by Saudi-funded clerics who told them not only to fight in Syria but to go home and create mayhem? You will think all this is made up, that I want to justify the massacres. There is no justification here. There is only the recitation of a pitiless history that is buried under official clichés. After 9/11, the Bush administration decided to ignore its own history. It was almost a crime to suggest that the wars to come would merely exacerbate the problem – throw fuel on the fires of hatred. A few days after that violence, I wrote, “nothing good comes from terror. It never did and it never will.” What I meant was not only the terror of those who attacked the US, but also the terror that was to follow. What came of the Bush wars is not the resolution of violence – Mission Accomplished, as Bush arrogantly said – but endless wars. Is there another way? After the Mumbai Attacks of 2008 (164 killed), the government of India did not rush to war. It opened a slow investigation into the attack and unraveled the plot and its execution. Diplomatic discussions opened with Pakistan, which is accused by India of harboring the planners of the attack. The file remains open. Patience is the order of the day. No hasty missile strike could make up for the attack in Mumbai. It would only have escalated the conflict further and drawn India and Pakistan into an intolerable war. It is far better to pursue the case prudently. You will not be outraged at the history of these countries, of the death they have occasioned. All parties agree that the problem of ISIS and al-Qaeda does not afford easy answers. The west has not been willing to confront its main west Asian allies – the Saudi kingdom and the Gulf emirates, whose funds continue to lubricate the networks of extremism and whose sheikhs continue to agitate young minds with dangerous ideas – including hateful sectarianism. No western country has put sufficient pressure on these countries to do anything. No western country has asked Turkey’s ruling party to set aside its own domestic ambitions and allow the Kurdish militias to fight ISIS freely. Not one western power has admitted that their continuous logistical support of proxies of Qatar, Saudi Arabia and Turkey has fed the cycle of extremism. No one has taken seriously the call from the UN member states to revise trade agreements and financial policy so that their countries are not suffocated into chaos, the breeding ground of terror. In 1992, Mali’s liberal leader Alpha Oumar Konaré asked the west to forgive his country’s odious debt. He could not lead his people out of division and poverty if he had to keep paying the banks every month, and if his farmers got no relief from adverse trade policy. No one listened. The US brushed him off, saying “virtue is its own reward” – meaning, pay up. Konaré could not move his agenda. He left office. The country imploded. Al-Qaeda took Mali’s second city Timbuktu. The French bombed them in 2013. The country remains shattered. It is the outcome of a series of bad policies. Nobody bothers with them. They are only interested in al-Qaeda of the Maghreb and its movements. Western policy-makers are like little boys playing with their little toys. They don’t see the human suffering and the terrible outcomes of their terrible polices. We are in pitiless times. There is terrible violence. There is awful sadness. This is for Adel Termos, of Beirut, who gave his life so others could live.